"This is the year to be a woman in the @stephenpetroniocompany. As Gia Kourlas writes, "Who wouldn't want the chance to be a slippery, flitting postmodern sylph?" 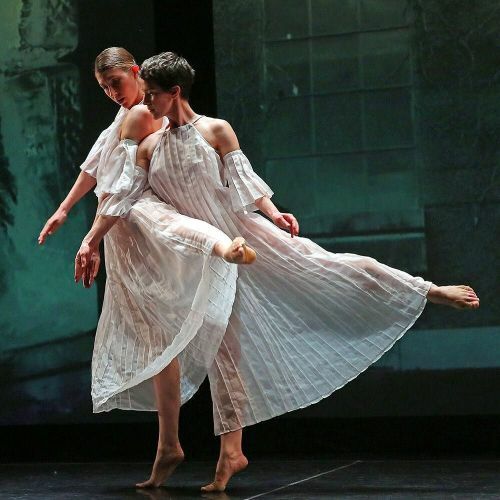 The @nytimes staff photographer @andrea_mohin photographed @emkstone, left, and @corikresge performing in "Glacial Decoy," in which 5 dancers wearing diaphanous shoulder-baring dresses glide forward and back in front of a shifting backdrop of photos capturing black-and-white slices of Americana. The @stephenpetroniocompany performs through Sunday at @thejoycetheater in Manhattan. Follow @andrea_mohin to see more photos." By nytimes on Instagram.